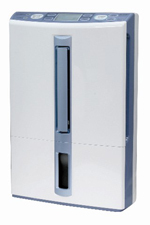 The Mitsubishi Dehumidifier is one of the best, perhaps the best, available in the UK. This brand presses all the buttons. Everyone wants their appliances to operate quietly. No dehumidifier is quiet but, for those who need a unit to control humidity in any area larger than a closet this is the quietest money can buy. Despite its power it is compact and for those who need a smaller model for a large area this unit is among the best. A common complaint in user reviews is about the short working lives of many brands. This company has produced exceptionally reliable models with these designs and, given excellent quality control and high manufacturing standards, it is able to report that less than 1% fail during the first year following purchase. Many of us need a dehumidifier for use in garage, workshop or boat. UK winters are cold and most refrigerant models do not work well in temperatures below 18°C. There are some excellent desiccant units on the market and they are very effective at low temperatures but cost more to run. The Mitsubishi dehumidifier has a "hot gas defrost" feature. This is far more effective than the "auto-defrost" provided by almost all other manufacturers and makes this a genuine low temperature appliance. With greater energy efficiency than desiccant units these two models offer the best of both worlds. What is more with continuous drainage and auto-restart (following a power cut) these units will continue to perform their vital task without the need for daily visits. These features make this brand ideal for boats, caravans and lock-up garages which may be some distance from your home. Of course there is a down side. This brand is more expensive than an average, run of the mill portable. Quality does not come cheap but with this company it is definitely a case of "you get what you pay for". For those who may be interested the next section tells you a little more about the manufacturer. The Mitsubishi Dehumidifier is well known for quietness, reliability, effectiveness and style; but who makes it? The Mitsubishi Group can trace its ancestry to the formation of a shipping company by Yataro Iwasaki in 1870. The name Mitsubishi was not adopted until 1873. One translation of the name is "three diamonds", explaining the Group's famous logo. Over the following years the company diversified into a variety of industries including, in the 20th Century, aircraft production. It became famous for producing the famous A6M "Zero" carrier-based fighter, as iconic in the East as the "Spitfire" and the "Flying Fortress" are in the West. Mitsubishi is not one company but rather several hundred independent ones. All share a common business philosophy and "brand" but are controlled by their own directors. It is one of these companies, Mitsubishi Electric, which manufactures these Dehumidifiers. 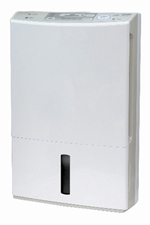 The MJ-E16V is a slim line home portable suitable for a smaller home or a substantial area within a larger house. It is relatively light in weight with a water extraction rate of 16 litres per day. The MJ-E16V includes a range of essential and useful features including hot gas defrost, an electronic humidistat, a continuous drainage option, an eight hour timer, electronic controls, auto-restart, and a large, four litre water collection container. The MJ-E16V is an exceptionally quiet performer, is effective at low temperatures and would suit anyone who needs to control moisture in a garage boat or caravan. Although more expensive than many apparently similar models the MJ-E16V is more capable and versatile than most and offers exceptional reliability. This unit has received enthusiastic reviews from consumers and we recommend it without reservation. The MJ-E16VX is the enhanced version of these otherwise identical machines. To hot gas defrost, continuous drainage, electronic controls and auto-restart, this Mitsubishi Dehumidifier adds a humidistat which can be regulated to control humidity levels more precisely, an on/off timer, a digital display and a more advanced air filtration system. These additional features provide even more functionality and extend the great flexibility of the MJ-E16V. Naturally these enhancements come at a higher price, around £40 higher than for the MJ-E16V, but for those who need them the additional cost is justified. The MJ-E16VX has all the virtues of its stable-mate and we are more than happy to recommend this Mitsubishi dehumidifier to our visitors.